International TableTop Day is this Saturday, a day where we celebrate getting together with family and friends to play games! Board games, card games, role-playing games, puzzles…anything that involves gathering in person and having fun around a table fits the bill! But we simply can’t wait until Saturday — plus the office is closed that day — so we’re hosting our PuzzleNation’s TableTop Day event in-house TODAY! And I figured what better day could there be for a round-up of puzzly crowdfunding campaigns marking some of the newest and most intriguing projects in the puzzle-game industry today! I’ve covered various campaigns for board games, card games, and puzzle projects across the Kickstarter and Indiegogo crowdfunding platforms over the years, and today I’d like to share three more that could use your attention. The first is the strategy game Tak. Tak is a collaboration between game designer James Ernest, head honcho of Cheapass Games and Hip Pocket Games, and author Patrick Rothfuss, creator of the Kingkiller Chronicle series, to bring to life a game featured in Rothfuss’s novel The Wise Man’s Fear. The premise sounds simple: build a road of pieces connecting opposite sides of the board. By using some pieces as parts of your road and others as walls to block your opponent, this mix of chess, Stratego, and Go is all about strategy. Plus, the game is adaptable, playable on square boards as small as 3×3 and as large as 8×8. This is a new pub game that feels like a timeless classic, and it looks perfect for puzzlers of all ages. Now let’s move from the pub to outer space with another Kickstarter campaign, Avoid the Void. This is a different sort of strategy game, since it’s all about outlasting your opponents, not completing a task first. In Avoid the Void, whole sectors of space are being replaced with black holes, and everyone is scrambling to gather resources and elude these hungry death traps. 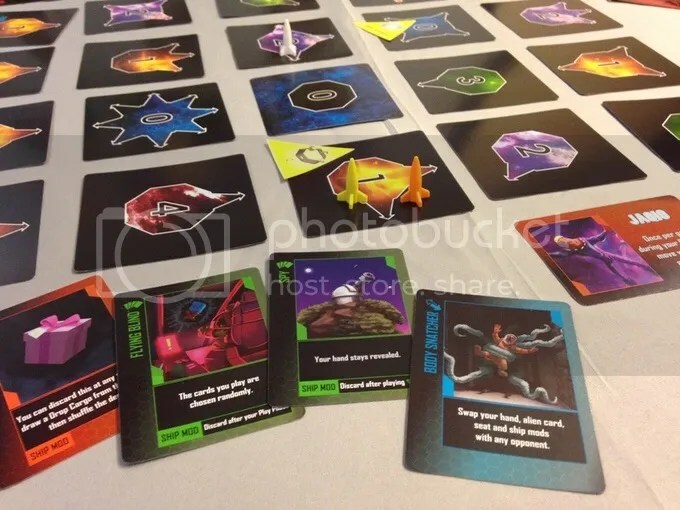 You’ve got an ever-changing gameboard, intriguing alien races (including one resembling a piece of cake), and all the reason in the world to deceive, outmaneuver, and betray your fellow players, just so you can stay in the universe a little while longer. This is a game designed for replayability, allowing you to indulge in all of the diabolical selfishness of games like Monopoly, but without the huge time commitment. After all, the universe is collapsing and there’s no time to waste! And speaking of replayability, the makers of this last Kickstarter campaign are known for puzzle games with high replay factor. Let’s talk about Pyramid Arcade from Looney Labs. We normally talk about Looney Labs card games like Fluxx or Loonacy, but their original product line revolved around the Looney Pyramids system: various games you can play with their signature colored pyramids. Now, they’re launching Pyramid Arcade, covering TWENTY-TWO different games and encompassing 90 pyramids of various colors. It’s their largest release ever, and with all the variants and mini-games they’ve created for these game pieces over the years, this promises to be a game set with endless possibilities. 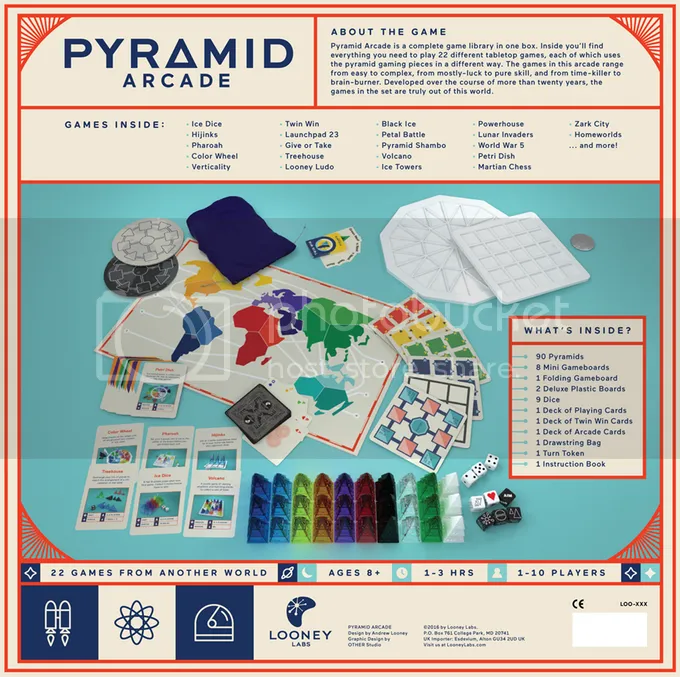 Pattern-matching games, chess- and Tic-Tac-Toe-inspired games, bluffing games, strategy games, and even a tower-building game…Pyramid Arcade literally has something for everyone. These are three intriguing and very worthy projects, and I hope you contribute to one or more of them. As someone who has become a regular donor to various Kickstarter and Indiegogo campaigns, I am proud to have funded some marvelous new ideas and watched them take shape over the months that followed.